Who Fishes for Alligator Gar? Most freshwater fish live less than 10 years, start reproducing at one or two years old, and produce offspring almost every year. Alligator gar are different. Female alligator gar can live more than 50 years, are capable of reproducing at five to 10 years, and reproduce only a few times each decade in most Texas waters. To successfully reproduce, alligator gar require large, overbank floods during the spring and early summer. Near the peak of these floods, congregations of five to 20 adults leave the river and seek shallow, grassy areas on the floodplain to spawn. Eggs are deposited over the vegetation, and after about 48 hours they hatch. The newly hatched young remain attached to flooded vegetation for another two to four days, after which they drift with receding flood waters. If flood waters recede too quickly, the eggs and larvae may die. Young alligator gar grow very quickly. They can exceed 5 inches in length after just one month, and up to 30 inches by their first winter. However, this rapid growth only lasts the first few years. It can take many, many years for fish to reach larger sizes. A six-foot alligator gar is usually between 10 and 30 years old and can weigh about 100 pounds. To become a seven-footer can take 20 to 50 years. Most individuals over 6 feet in length are females, as males rarely reach this length. The current world record alligator gar, captured in Mississippi in 2011, was 8 feet 5 inches long and weighed 327 pounds! Its age was estimated at 95 years. Although most fish won't reach that age, several large specimens recently collected in Texas have been estimated to exceed 60 years old. Compared with other sportfish, alligator gar are few in number because they are near the top of the food chain. A Texas lake or river supporting a population of 5,000 to 10,000 adult alligator gar might also support 100,000 to 500,000 bass or crappie. Because they are long-lived and reproduce infrequently, alligator gar can only sustain harvest rates of about 5 percent each year. That means anglers can only harvest 250 to 500 each year from most populations. If too many fish are taken, populations can quickly decline and only young, small fish will remain. 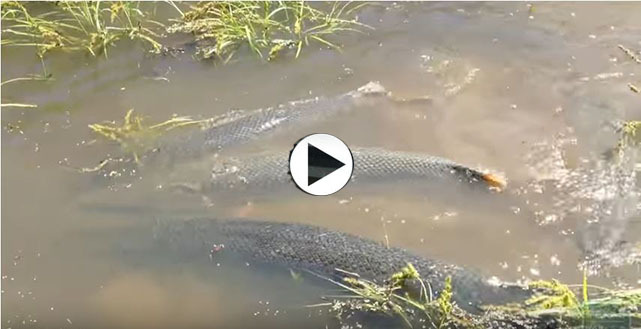 Once an alligator gar population declines, it can take decades to restore. In contrast, sustainable harvest for bass or crappie can be 25 percent or more per year, which means anglers can harvest 25,000 to 125,000 fish from most populations. Bass and crappie populations can rebound much more quickly than alligator gar because they reach adulthood in one to two years and successfully reproduce nearly every year. Texans are fortunate to have many healthy populations of alligator gar where fish in excess of 200 pounds can be found. Unfortunately, in much of the rest of their native range, alligator gar populations have suffered significant declines due to overharvest and because dams and levees have limited access to floodplain spawning habitats. To maintain this unique resource for future generations of Texans, effective management and habitat conservation are needed. Current management aims to limit harvest so that enough mature females remain to reproduce and so there are plenty of large, recreationally valuable fish for anglers to catch. Maintaining current populations also requires working with landowners and with agencies that control water levels in rivers and reservoirs to ensure that fish have access to floodplain spawning habitats.